Japan Air Lines offers valuable pass with which you can take any domestic frights operated by JAL for a discounted fee. You can get to more than 30 airports in the country for 10,800 JPY one section. Reservations and purchase can be completed on the official website. Services are available between Izumo (Shimane) and Tokyo, Osaka (Itami), and Fukuoka (Kyushu). 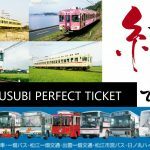 Japan Railway company offers valuable train tickets with which you can get any train services including bullet trains (*there are some exceptional though) operated by JR. JR’s service covers throughout Japan and you can get to almost all of the destinations you want. Pass varies by the validity periods, areas and the duration, so you can choose the most useful one for your trip. 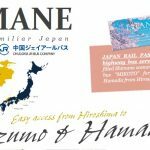 You can purchase the exchange order for the JAPAN RAIL PASS at sales offices or agents in your country then exchange it for the pass in Japan. Please check the official cite for details. Willar Express Company offers valuable pass ticket which allows you to get to any destinations on 3 or 5 days of your travel. You can choose any three or 5 travel days during two months after the purchase. Please click here to check available routes. 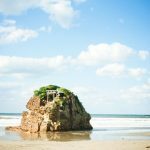 Services between Tokyo and Matsue, Hiroshima and Matsue are available, so how about visiting Shimane after Hiroshima and exploring this unfamiliar Japan? Then you can get back to Hiroshima or Tokyo, or you can also come to Shimane directly from Tokyo. With this bus pass, you can save a lot of money. This is another special offer to overseas travelers. 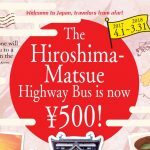 Highway bus service between Matsue (Shimane) and Hiroshima is available for 2,050 JPY one way. Please note that tickets can be purchased only at ticket windows a month in advance. Please click here for farther information.